Travel Agents | Gate 1 Travel - More of the World For Less! 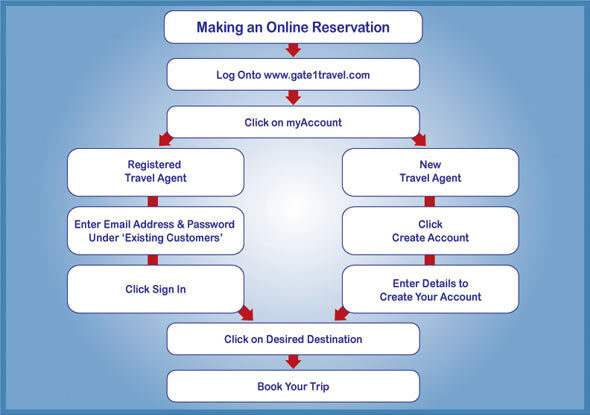 Why Book With Gate 1 Travel? If your agency is already registered, and you need an individual agent account, log into My Account with the IATA/CLIA/TRUE number and agency-unique password. Gate 1 Travel's Vacation Builder application is a dynamic packaging process through which agents and customers can shop for multiple types of service: flights, hotels, transfers, sightseeing and miscellaneous services. You are able to completely customize your client's vacation! If you have questions or need assistance making a booking, our reservation specialists can help. Call us at 1-800-682-3333 or email agentsupport@gate1travel.com. You can also reach the Frequently Asked Questions page from anywhere on the site. Just click the link at the bottom of every page.